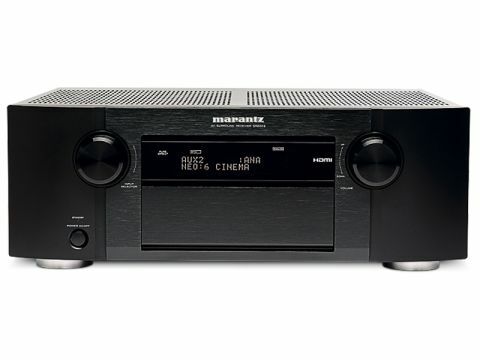 Let's not beat about the bush, the Marantz SR6003 is ﬁrst-class eye-candy. The all-new chassis and fascia design are grafted from the brand's high-end stereo products, creating a device that looks as sophisticated as Kate Winslet at the BAFTAs. In Marantz's silver-gold ﬁnish, the SR6003 makes the mid-range competition look distinctly B-list. Shame then I got the boring black sample to review. Hey-ho. Still, a peek under the hood reveals quite a star-studded suite of components and features. The ubiquitous decoding for Dolby TrueHD and DTS-HD Master audio is joined by Audyssey MultEQ room calibration, a high-quality 1080p video scaler from iChips and v1.3 HDMI connections. Better still the conﬁguration of HDMI ports is three-in, two out (switchable) which will be heaven for those of us with a TV and projector in the same room or a desire for multiroom HDMI feeds. Search as I might though, there was no port for an iPod dock, which probably makes the SR6003 something of an anarchist, although there is a front-mounted USB port. More important for cinephiles is the seven channels of 100W muscle and slick graphic user interface. Setup is auto-Audyssey simple and the GUI offers crisp matrix-style grids for input allocation that is second-to-none. Bizarre then that the onscreen overlay volume indication is low-res block text. The programmable remote is rather festooned with buttons but the orange back-light covers every key and the small LCD screen lets you know which source you are controlling. You really can't go wrong – even accessing the EQ settings for a quick tweak is painless. Clearly the SR6003 is keeping pace with trends operationally as well as cosmetically. But in terms of absolute features, it's a little outgunned by the minutiae features of the Denons, Yamahas and Onkyos in this price category. Yet I can't say it really misses it. You feel that Marantz has eschewed bells and whistles in favour of a few dollars more spent on components and performance, as the enormous transformer visible through the vents will testify. Even before the ﬁrst ﬁlm I can't help thinking the SR6003 is the AV equivalent of thinking-man's totty. Thankfully it's no shrinking violet in performance. The epic soundtrack that opens Beowulf (Blu-ray), complete with resounding tribal drums and massed chanting, draws you straight in to the great mead hall's hedonistic revelry. The sound is big and fulsome with an intense soundstage that is rich in detail without sounding overtly 'effecty'. Some of the Marantz's competitors have crafted this scene with more space and air, giving a more open feel to the set, but the Marantz perfects the enclosed, smoky ambience in everything but the smell of spilled ale. It also encourages heroic use of the volume control – meaning that when the hall doors blow off, the subsequent boom will see every speaker giving its all. The silence that follows is intense and eerie. The Marantz's super-low noise ﬂoor ensures there is no hiss or hums to detract you from the scene. The creaks and groans of the building's woodwork and odd shufﬂing of characters in the rear are frighteningly realistic, placing you right there, waiting for Grendel. The ultra-violent ﬁght scene simply explodes out of the speakers with superb dynamic attack. Each effect is crisp, deﬁned and placed perfectly in the room. Again, I've heard these effects expanded and thrown further 'out' into the soundstage but the Marantz's oppressive intensity is less intrusive and more compelling throughout. Cut to Beowulf's ship ﬁghting a stormy sea and the dialogue cuts through the chaos, buff and clean. While some might chide me for mentioning two-channel stereo in this home cinema magazine, I will say the Marantz is a musical peach. It is smooth and sophisticated with soaring scale and a nicely melliﬂuous top-end that suits a wide range of musical genres. Good-looking, well built, solidly featured and thoroughly addictive with both movies and music, the Marantz SR6003 has a lot going for it.